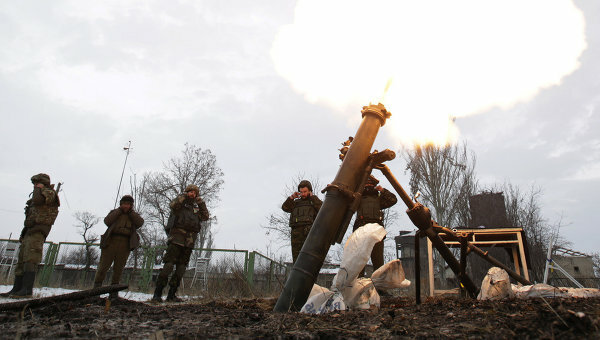 Over the past day, Kiev junta’s punitive forces fired 30 shells at the Donetsk and Lugansk People’s Republics territory by 122mm artillery alone, according to the information bulletin of Donetsk People’s Republic (DPR) Ministry of Defense dated by March 7th, the independent online edition «Dni24» informed. A total of about a thousand shells were fired, resulting in ceasefire violations. 120mm and 82mm mortars were used more than two hundred times, anti-tank guns MT-12 “Rapira” were used 6 times. Different kinds of armored vehicles, grenade launchers were involved, snipers were active. Zaytsevo, Veseloe, Spartak, Komenternovo, Bezimennoe, Sahanka, Sosnovskaya villages, the areas of the former Donetsk Airport and “Volvo-center” are the most severely damaged by the shelling. At night, the Ukrainian army clashed with DPR Armed Forces not far from Krasnogorovka town of Mariinka district. It was reported that the Kyiv junta’s military suffered serious casualties. During the past day, the positions of People’s Militia of Lugansk People’s Republic were shelled more than six times. The Ukrainian side represents the battle, which has occurred in the past day near Kranosgorovka town, as the successful liquidation of Russian sabotage-reconnaissance group by the Ukrainian military and reports either the absence of casualties or minor losses, meaning a few dead and five easily injured. At the same time, according to the information from Kharkov, Ukrainian volunteers and physicians were working in emergency conditions overnight, not coping with the influx of badly wounded. The incidents of ceasefire violation by Kiev side are sharply increased lately. ← “Essence of Time” mission in Donbass congratulates all women with the International Women’s Day!